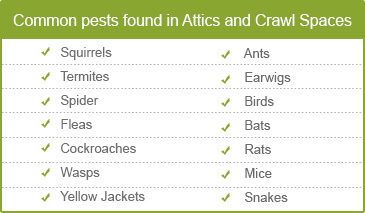 Found some diminutive creatures ruining your attic spaces? Hurry up! Else these small and innocuous looking creatures will devastate your property. Regular inspection and timely check is thus vital to keep your Attic & Crawl spaces clean, hygienic and effective. To do this work at the earnest, Quartz Solutions – a team of experienced workers outfitted with latest technology, is indeed the undisputed choice. Be it treatment for pest control, checking and correcting leaking ducts or testing and clearing the attic off harmful gases; our team has a tailor-made solution for all your Attic & Crawl space needs. The presence of bugs and termites will slowly but surely wreck havoc in your property. A careful and quick approach to handle these menaces thus proves helpful. Not to miss, the draining financial expenses. Presence of Termites, mold and mildew can do extensive damage to your home/office especially wooden structure and furniture. Leakage in ducts and any moisture in structure allow termites to grow above the ground. Moth’s larvae can cause damage to clothes, fabrics, furs, leather and carpets. Rats, cockroaches and wasps in your property can pose serious health concerns. Bacteria present in mice’s feces and urine make area infected and smelly. Water damage, see pages, leaks, cracks, and mold are among the most common attic problems. And if they are not tackled quickly the damage can rapidly spread to the rest of the house. Regular attic inspection and that to by professionals will allow you to spot problems early on and you’ll know what to do before the costs become prohibitive and you are looking at a wide scale project all of a sudden. This value able judgment is done by our experienced technicians for your convenience, it’s free of cost. Once the team is over with the cleaning bit, the process of maintenance and upgrading sets in. This not only enhances the efficiency of your property but also cuts down on recurrent financial outflows. Here’s a list of things that we can change from better to the best. Quartz Solutions value your time and earnings. 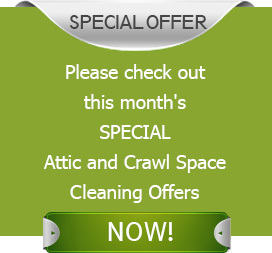 We provide a wide range of attic cleaning services and solutions at most feasible, lucrative and competitive prices. We adore Bergen County, New Jersey, and its wonderful society. It’s a small effort from Quartz Solutions to provide you and your family a safe and healthy life by keeping your attic and crawl space in superlative condition. So what are you waiting for? Grab your phone and dial 201-205-2042 to get the benefits of free inspection by Quartz Solutions. My attic was cluttered with boxes and worn out insulation so I hired a professional company. Quartz Solutions came over and cleaned up the place. Josh and his crew did an amazing job. Thanks!